Iceland meets Sheffield – no, it’s not the ever expanding chain of budget supermarket, but a satisfying mash-up EP from Denmark-based Icelander Snævar Albertsson (a.k.a – Dad Rocks!) and Steel City producer Jack Hetherington (a.k.a 6001 Hulls). Dad Rocks’ compositions are complex, subtle, and often colourful in their structure and performance. Using elements of experimental, electronic, and firm Folk foundations, Snævar Albertsson is certainly an Icelandic force to be taken seriously. But, ever pursuing perfection, Dad handed his work over to experienced Sheffield producer 6001 Hulls for a refined electronic touch. The result? Something beautiful, easy-listening, and colourful. Easily at the head of the pack of this six-song package are the tracks ‘Melt’ and ‘Said the Landlord’ – both striking a decent balance between obscurity through various effects and reverbs, and revealing fragility in the neatly preserved clips from Dad Rocks! 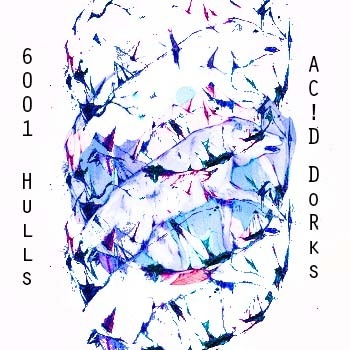 The influence from 6001 Hulls is certainly not damaging at all, and Jack Hetherington’s magic adds a different layer of colour to some arguably bleak compositions. Yet, upon revisiting some of Dad Rocks! compositions (and those of his other outfit, Mimas), you realise that the 6001 Hulls modifications do somewhat simplify the ethereal melodies of the original. What was once understated has become somewhat obvious and a little repetitive. And, by track three, you cannot help but thinking this music is little more than good music to have in a television advertisement for an energy company, or to accompany a montage advertising the latest HBO drama series that may be a hit in the US. With that said, tracks like ‘Said the Landlord’ certainly benefit from 6001 Hulls touch. This track is possibly my favourite on the EP, combining simple guitar riffs with cutting, savage lyrics, and murmured, spookily uplifting vocals. It’s rare that something so obscure, so unknown, can make such an impression, but it certainly made one on me. This mash-up has been described as ‘Post-Rock’, or ‘Death Indie’. I think they’re both not wholly accurate – I prefer ‘Folktronic’. If you’re looking for something combining James Yuill with some distinctly Sigur Ros inspired licks, then you cannot go far wrong with this EP. Dad Rocks! Tumblr. Bandcamp. Myspace. Last.fm. Facebook. Soundcloud. Twitter. Posted in Apocalyptic stuff, reviewsTagged 6001 Hulls, Dad Rocks!, Mash up, Sheffield vs Iceland vs YouBookmark the permalink. Thanks for the review. This EP has not been described as death-indie or post-rock. That’s Mimas, and has nothing to do with Dad Rocks! or 6001 Hulls. Thanks again!